and all out-of-town buses that arrive and depart from Hamilton's GO Centre. If you drive to campus, you will need to pay a deposit for parking. For rates and deposit information, please visit this page. McMaster actively promotes sustainable forms of transportation through the Office of Sustainability. Consider choosing an alternative to driving when visiting McMaster. 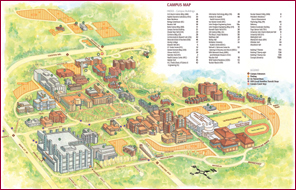 Visit sustainability.mcmaster.ca for more information on biking, transit, walking and carpooling to and from campus.